In an attempt to build up my artwork for the gallery wall I’m putting in my home office/craft room, I came up with this glitter bombed piece of work. It’s Andy Warhol meets Liberace. Or something like that. I was going to say Andy Warhol meets Kesha. But I’m not a fan. Homegirl has got to go. 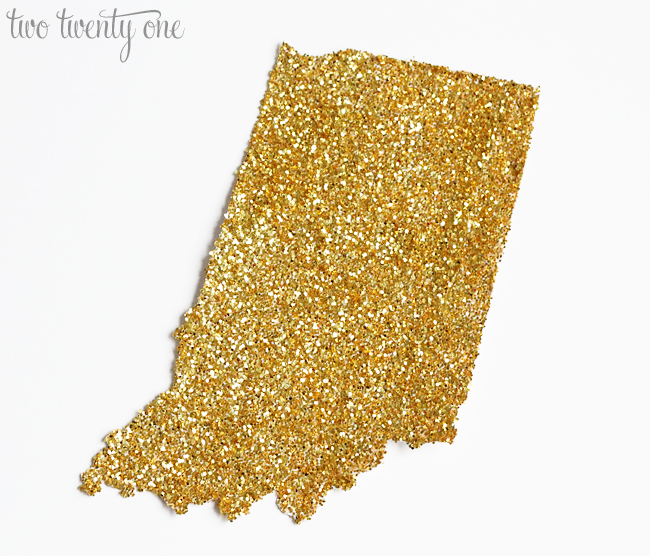 Anyway, I came up with the idea to pay homage to my state by covering it in glitter. 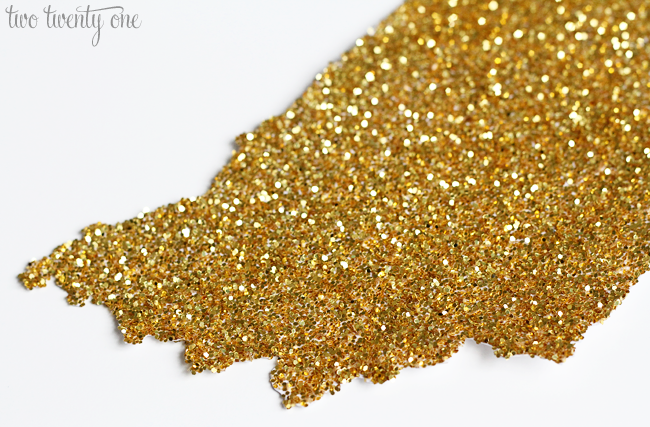 You can never go wrong with copious amounts of gold glitter. Never. I started by finding an image of my lovely state through a google images search. Then I sized and flipped the image in Photoshop. Why? Because when I cut it out I didn’t want any of the black outline to show. You can flip images in Word. Just google it. I printed it out on card stock. The card stock is important. This won’t work very well with regular ole paper. Then I cut it out (see how there aren’t any black lines on this side?) and grabbed my Mod Podge. I put a thick layer of Mod Podge on the cut out with a foam brush. 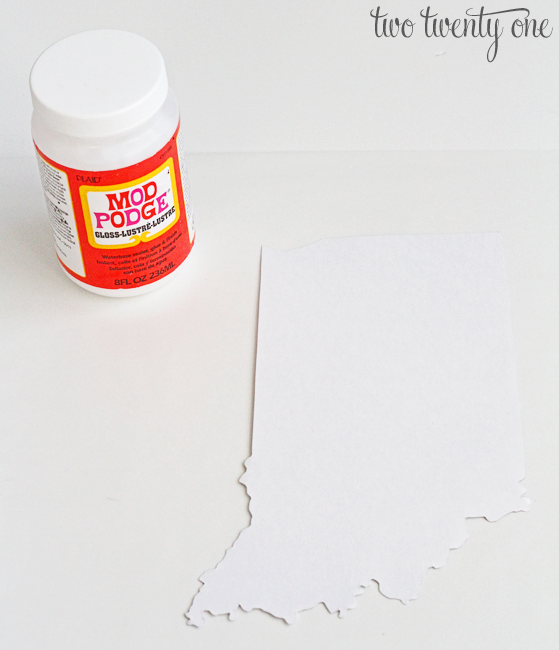 Make sure you put enough Mod Podge on, but don’t go too crazy. I grabbed my gold glitter and covered the Mod Podge covered state. You can go crazy with this step. I waited until the Mod Podge had dried and shook off the excess glitter. There were some spots where the glitter didn’t stick well so I dabbed some Mod Podge on with a toothpick, poured on some more glitter, and let it dry. I didn’t take a photo of this, but I also sprayed it with Rustoleum clear gloss to seal the glitter. Tip: Spray from at least 2 feet away. Don’t go overboard. Spray a light layer and go back and do another layer if needed. If you spray too much it’ll look bad. Read more about this step here. 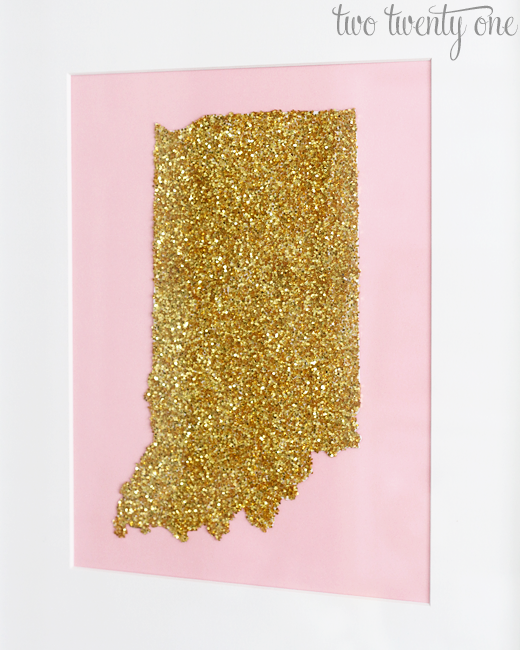 Then I took my goldified Indiana and attached it to a piece of pink card stock with double sided tape. I went with pink because it’s what I had and gold and pink look good together. 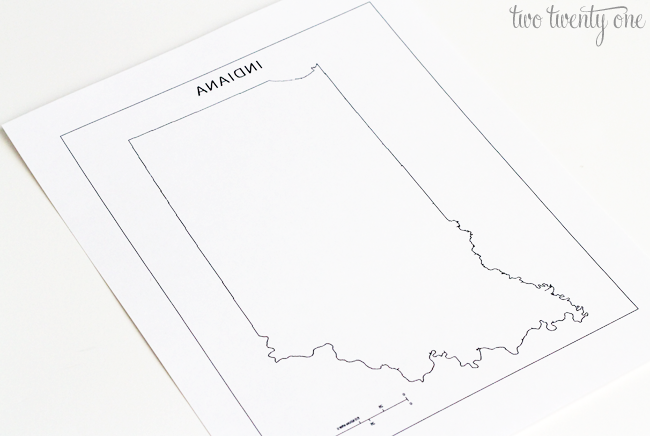 But this would also look great with emerald green, navy, or turquoise paper. I grabbed an Ikea picture frame with an 8×10 opening and slapped the bad boy in it. I think it turned out pretty well for a spur of the moment idea. Chelsea it’s a shiny beauty! I love anything Midwestern since I was born and raised in MN and have since relocated East. It must have been painstaking to cut out that bottom wiggly border!! but the results are perfection. Great project using minimal supplies most of us already have on hand, I’m thinking silver for the Empire State (NY). Super cute! You can never go wrong with glitter! Hmmm… I think that’s pretty darn cute. I can glitter and glue too, so it’s doable. So cute! 🙂 I love all your Indiana pride. I should get some Illinois pride goin’ on up in here. And, like Ashley said above, I like Ke$ha because she’s such a mess. haha 😉 Makes for some good (i.e. embarrassing) car-dancing during my commute. OMG! Love love love this!!! Totally copying you! So absolutely adorable! 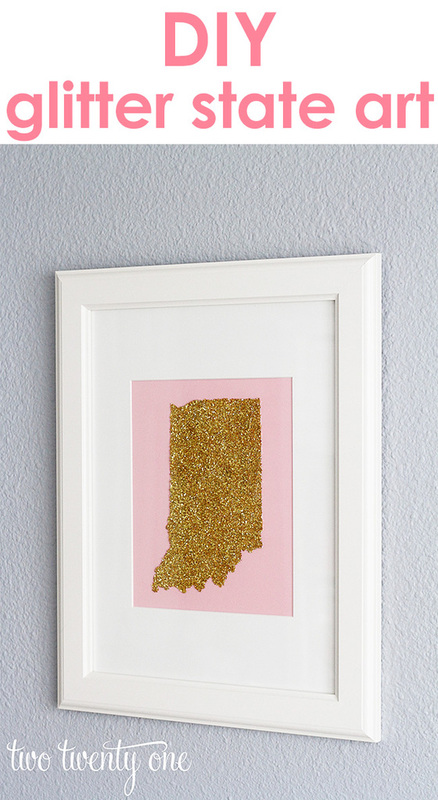 With all the states we have lived in, I could have a glitter state wall…lol! Oh my goodness I LOVE this! I want to make one for my friends as gifts! Thank you! You should definitely sell these in your Etsy shop!!! I’m all about shaking the glitter off my clothes now. Very cute! This is adorable and I also despise Kesha. TWINSIES. 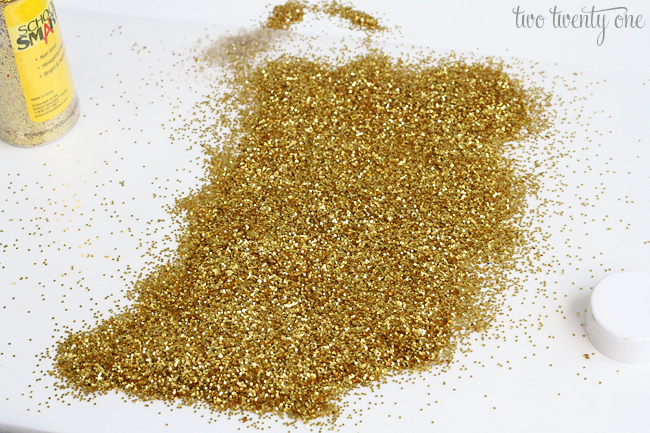 Also, glitter reminds me of my sorority days…homecoming, banners, floats, etc.! 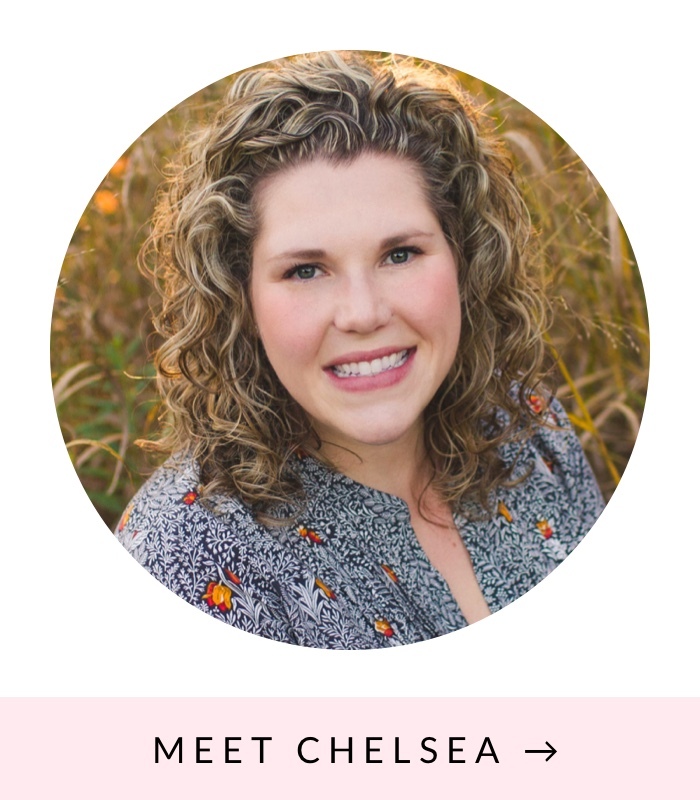 This is very cute, Chelsea. And think of the possibilities – one could glitter nearly any shape with the help of mod Podge. Grey inspiration. We are a military family & this is such a great idea. My husband saves all our license plates in the garage or his work sheds but it’d be nice to have something in the house. He’s been in a long time & will retire. Some of you may have never herd the saying but us wives say “Home is Where the Army Send You. Than you! Chelsea, I saw this on IG and now on your lovely blog. I LOVE this idea. p.s. I freaking love glitter. This is supa-fabulous. I saw it on pinterest and loved it before I even knew it was yours. I’m dying to try it! This is so great! I’ve already started working on my copy cat project. 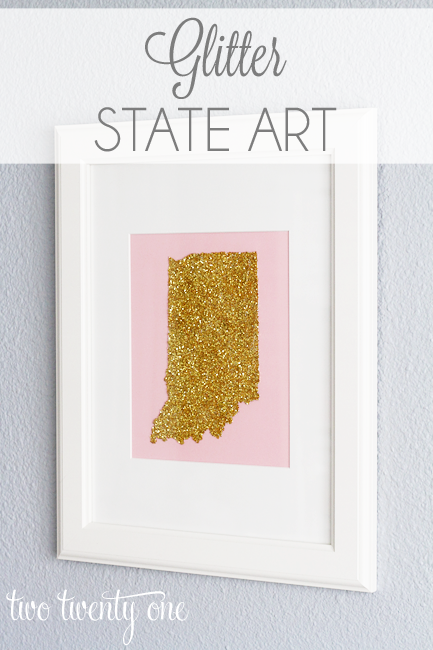 … doing the 5 states I’ve lived in with black glitter for my black & white gallery wall. Thanks for the inspiration! Holy cow – it looks so fantastic and so great!! I am so filing this away for a future project – I just love it! I think this is a cute idea and a great project to do with kids. This is something I would be willing to try. I will share on my blog with my own state. I will reference you with a link back to you. Love this. Going to make one for our gallery wall too. Visiting from tatertots and jello. What a cute idea! I love the gold glitter on the pink background, it looks great! PS. 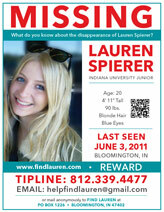 K-Dollar Sign-Ha has got to go..
You have me at Indiana! As a hoosier for 21 years, I miss the state dearly. What a fun way to make art. Sweet! Oh goodness, love this SO much. I love glitter so this is right up my alley! I LURV THIS!!! Indiana is my Jam! I’m doing this fa show! new follower here. Super glad I found you! So cute! Will definitely be trying! Your favorite reason appeared to be on the internet the simplest thing to keep in mind of. I love this idea! 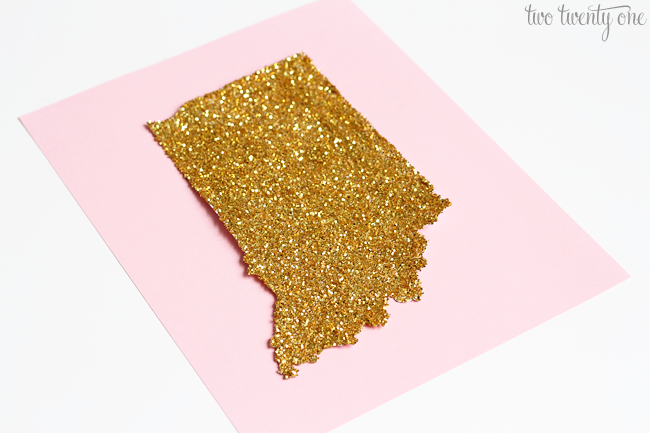 Anything Glitter makes us Girls so “oooo and ahhhh” and having home state pride is so awesome, so I feel like this is the perfect project! I for sure want to do this soon and put it on my wall! Such a good idea! Thanks for sharing! I ove this project- it would look great in a ton of different rooms! Very fun idea! Love the glitter on the pink background. Visiting from Ladies Collective Linkup. I just stumbled upon you as i was checking out paint colors for my master bedroom! Your projects are so cheerful and peacefilled I’m loving your style. I was wondering what paint you used for the wall in the background?